Well we are already to October 10th and we are well into football season, NFL; college; high school; youth; etc. And if you are in the habit of attending a game you might be interested in the Stadium Seat offered at CoolStuffForDads.com. This item is a portable padded stadium seat with 2 large utility zipper pockets is made of 600D polyester canvas. 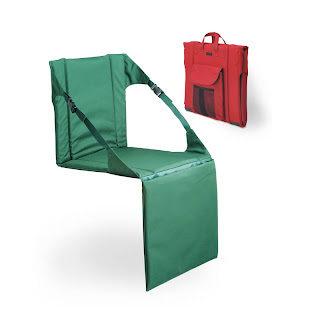 This padded seat provides full back support, which is especially useful when sitting on hard bleacher seats or benches. A convenient shoulder strap allows the pack to be carried and used as a tote bag (featuring state-of the-art Thermo-Guard insulation). Utility pockets keep essentials at hand. With the Stadium pack, you'll always sit in comfort. Makes a perfect gift!